OD: Top .959" Bottom 1.061"
ID: Top .636" Bottom .738"
Comp Cams Beehive Valve Springs are revolutionizing performance street/strip applications! These valve springs deliver inceased valve train stability, and a reduction in weight. This is achieved with less spring pressure for better valve control and reduced weight of both the spring and the retainer. Using Comp Spintron testing equipment, the Beehive spring was engineered to maximize "harmonic resistance" through reduced mass and unique coil spacing. With highly reduced internal spring harmonics, engines equipped with these state-of-the-art Beehive valve springs rev higher and live longer as compared with other "performance" springs. 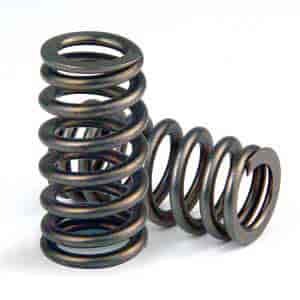 For street/strip applications, these valve springs are the best choice possible. Because of the unique Beehive design, the valve train can handle more rpm and more aggressive cam profiles for occasional bracket racing but still retain durability for street driving. Does COMP Cams 26113-1 fit your vehicle?